Dinner ideas do not come to me very often. 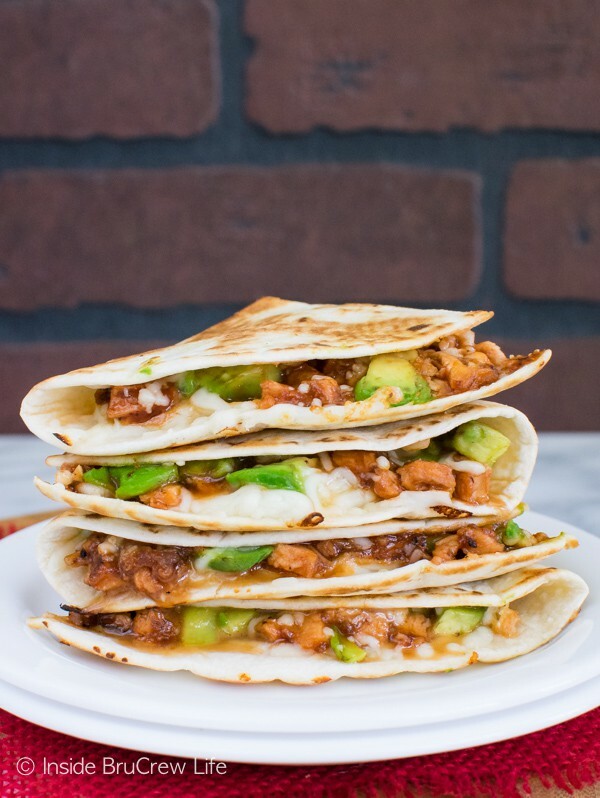 I was pretty excited to create these BBQ Chicken & Avocado Quesadillas for my kids the other night. PIN IT NOW TO SAVE THIS RECIPE FOR LATER! In fact, when I have to come up with a dinner idea on the spot, I blank completely. and good bloggy friends who post yummy dinners. by the time I have dinner plated up. I could probably rattle off at least 10 decadent options for you. And I probably have all the ingredients in my pantry to make those dessert right away. Dessert is so much easier to photograph too. I’m not sure why my brain doesn’t like dinner. Maybe all the chocolate chips and homemade oatmeal cream pies have warped it totally. that we exist on cereal, pancakes, and of course leftovers. Let’s not forget the token chicken nuggets and mac & cheese that happens all the time too. This easy dinner was based on the leftovers from the other night. All day I was thinking about the chicken that we had in the fridge. What could we do with it other than have another salad again??? was putting it in a grilled cheese sandwich or a quesadilla. And do you know what? Cheese, chicken, and avocados are delicious together. 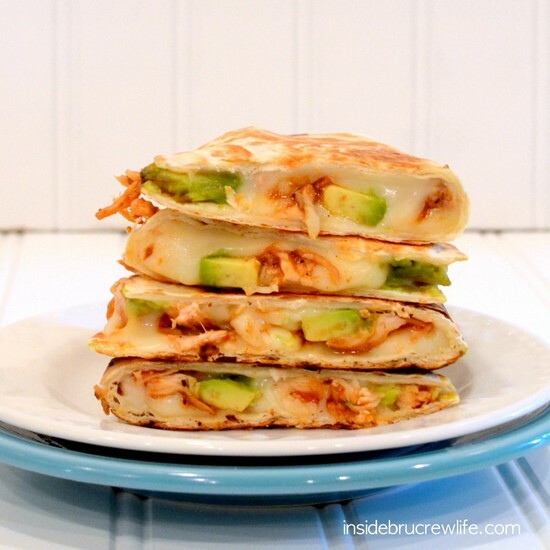 These BBQ Chicken & Avocado Quesadillas were so good that I just had to share it with you right away. can you guess what I am making for lunch again today??? 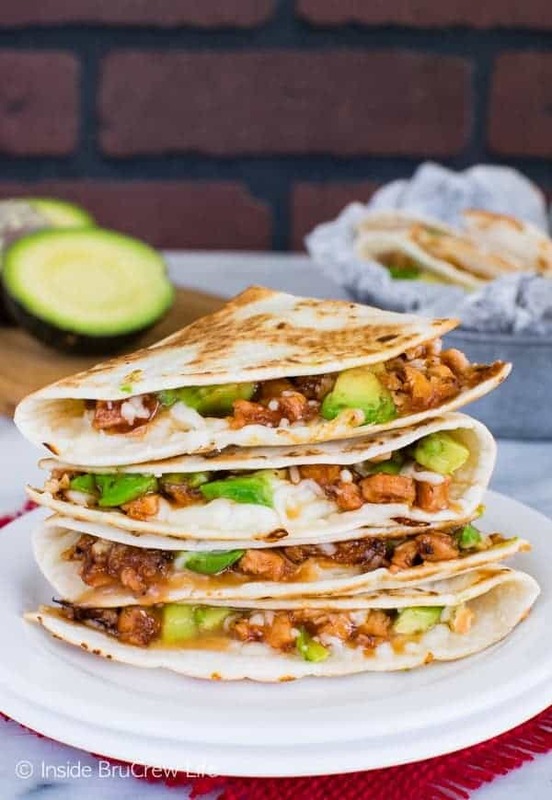 Cheese quesadillas filled with barbecue chicken and avocado chunks makes a great easy dinner recipe. This meal always disappears in our house. 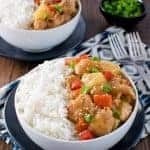 Stir together the chicken and barbecue sauce. Place 2 tortilla shells side by side in the bottom of the pan and sprinkle half of each tortilla with cheese. Top with half the chicken mixture and 1/2 of the avocado chunks. Sprinkle with cheese. Fold the tortillas over and cook until the bottom is golden brown. Flip the quesadillas over carefully and heat the opposite side until that side is golden brown and the cheese is melted. Repeat with the remaining ingredients. Cut each tortilla in half. Serve immediately. Makes 8 wedges. That sounds AMAZING!! Love the flavor combination! Thanks for a great meal idea!! These look sooo yummy. Pinning! 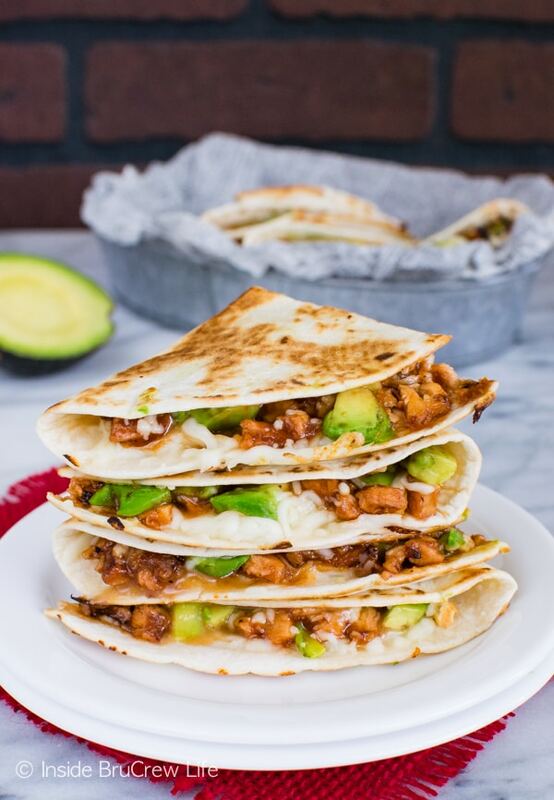 I love avocados, so in a quesadilla with bbq chicken? Genius! I don’t mind dinnertime and cooking dinner, but I tend to make the same things over a course of two weeks! Especially when it comes to the slow cooker, which I use at least 4 days a week! I may change an ingredient here or there in a recipe, but I’m a creature of habit. Which is quite the opposite with desserts. I don’t make the same dessert very often. Because like you, there are so many choices and my pantry is almost always stocked! These look really good. Out of all the quesadilla combinations I have tried, for some reason I never tried BBQ chicken. I will have to try this sometime. Thanks! Jocelyn, I had to pin this before I even read the post. My middle child could live on quesadillas alone! I’m with you about the whole dinner thing. The only real reason to even have dinner is to get to dessert, in my opinion. And yes, we have had cereal for dinner before, even with hubby home and not even healthy cereal, I’m talking Captain Crunch and Fruity Pebbles, but hey, 8 vitamins and minerals has to count for something! I love all of these ingredients! What a great combination…I will be making this soon!! MMMMMM. BBQ chicken and avocado should be married. 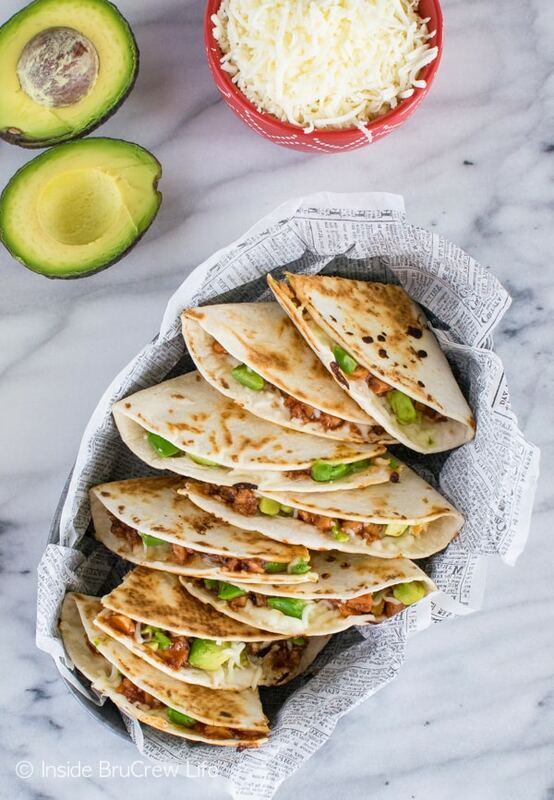 I am digging those fat chunks of avo in your quesadilla; looks SO good! Ha! I’m with you about dinner ideas. It’s so much more fun to bake than actually make a meal. But this does look amazing!!! Okay, we’ll you know me and avocado. I want this for dinner! I loooooooooooooooooooove quesadillas and we are always looking for new ways to make them (am I the only one who gets into a dinner rut and makes the same things over and over and over??). These look so amazing! Oh yum, that looks delicious, I am going to pin this one! Fantastic idea! Love this flavor combo…you have such great!!! ideas!! BBQ always gets my families attention. 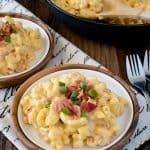 Love how easy and I am sure tasty this would be. I LOVE your photography skills!! 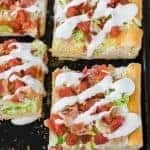 You could make cereal look gourmet 🙂 I LOVE quesidillas & never thought of adding avocado…YUM!! These look amazing! I pinned these and need to try them out, thanks for sharing! This sounds wonderful! I love making quesadillas!!! Um, perfect timing on this post! Last night, I was trying to figure out what I could do with an avocado, and then I remembered this dinner idea!! Better yet, I had leftover roasted chicken from the night before! Now, we were out of bbq sauce, but I threw some stuff together that resembled it, and it was fabulous! 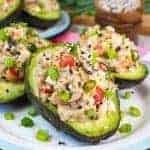 Nice use of avocado. 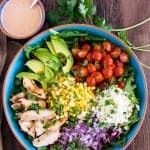 It would be super if you linked this post in to Food on Friday Series which is all about avocado this week. What exactly is BBQ chicken? The chicken in your picture looks saucy. Like a “pulled chicken” thing. Or is it a chicken that has been barbecued and shredded? Yes, it is shredded chicken that has barbecue sauce on it. Sorry for the confusion. I updated the recipe to reflect that. I made this for lunch yesterday, well half of one as I only had 1 tortilla left, and I was certainly not disappointed (though I am disappointed now that I don’t have any more tortillas and would love to have this for lunch again!). Such a great flavor combination, yum! I struggle with dinner ideas too, usually just circulating through the same “tried and true” recipes. I like to save the experimenting for the fun stuff! 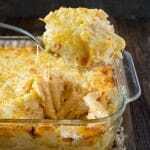 I just tried this recipe using canned chicken and it tasted great and was quick! Kids asked me to make it again. Love that it’s only a few ingredients and looks delicious. All my favorite things together. Can’t wait to give this a try. Yum! Avocados make everything delicious. Love how they will taste in this quesadilla. Luck on my side or what. I had bbq cgicken left over, rioe avocados sitting in my fruit bowl and i searched quesadillas on pinterest and bang all my ingrediebts showed up. My boys will love this. Thanks. Pinterest is always a saviour. I made these for dinner last night and they were SO good. Highly recommend to anyone looking for a quick, delicious dinner or lunch idea. Could you use corn tortillas instead? Can you use corn tortillas instead? Unlike most other comments, I made these last night to try and they wer delicious!! I only had Monterey Jack cheese and sweet honey BBQ sauce, frozen grilled chicken from Tyson, tortillas, and an avocado. It actually all went together perfectly!! Thanks for the recipe! It’s a new staple in our house! I am so glad to hear you tried the recipe and loved it! It’s one of our favorites too! I forgot to include we used ranch as a dipping sauce cause my son wasn’t too fond of the avocado. We all ended up loving it with it.